The mildest cases of whiplash injury can improve after a few days when treated with rest and aspirin or other over-the-counter anti-inflammatory medications. Some doctors recommend taking it easy during the first two weeks after an accident, but staying in bed is usually not necessary. It is appropriate to take short walks and to go to work for a few hours or more each day, if the job does not put much stress on neck and shoulder muscles. Sports, carrying heavy groceries, and other physically demanding activities, however, should be avoided. Patients are often advised to wear a soft cervical collar with the low section under the chin so that the high back keeps the neck from bending backward. The collar also takes weight off of the muscles. It should be worn intermittently to reduce dependency and it is especially appropriate for settings where pain is most likely to occur, such as driving or riding in moving vehicles that agitate the neck. If the neck pain is constant and persistent, muscle spasms occur as the head is turned, or pain and spasms spread to the shoulder and upper arm. Other measures, such as spine surgery, may be needed. This procedure may be used to treat herniated discs in the cervical spine. A discectomy involves the removal of a portion of the intervertebral disc that is putting pressure on the spinal cord or radiating nerves. The Bonati Spine Institute encourages patients with whiplash to contact us to request a no-obligation MRI review or discuss your conditions with our medical professionals. 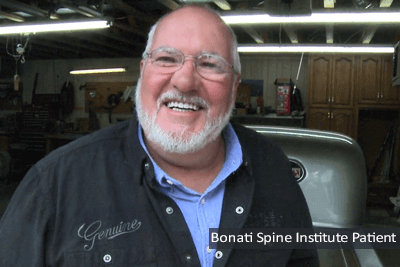 Find out why The Bonati Spine Procedures are considered to be among the world’s best solutions when it comes to advanced spine surgery. Your pain from whiplash can become a thing of the past.